I don’t think I’ve mentioned it, but I have a running injury that has me going to physical therapy twice a week before work. Being that I’m not a morning person anyway, this whole routine of getting up extra early to do hip exercises that leave me achy for the rest of the day is making me a little cranky. Thankfully, this week is a short workweek, and it’s been semi-quiet, so I can ease into the morning’s emails and my writing project while I recover from the torture sessions with my therapist. By the time the day ends, though, I’m ready to be home with a glass of wine in my hand and a heating pad on my hip. And, Tuesday night’s wine, combined with my two TiVo’d episodes of Castle, was exactly what I needed to recover. Is this worth a glass after work? Definitely! If you see this wine in the store, grab it; you won’t be disappointed. 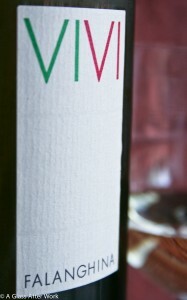 At a SRP of $12, this wine is a perfect summer wine that is a unique alternative to a Sauvignon Blanc or Pinot Grigio. It would be the type of wine that pairs nicely with a light fish or a salad, but also is enjoyable on its own. Admittedly, with the warm weather in DC this week combined with opening this wine has given me a little bit of Spring fever! Question of the Day: Have you ever had Falanghina? What were you thoughts on the grape? Falanghina is definitely on the rise. I see it/enjoy it in a variety of places now.